Margie Beatrice Varner was born on March 2, 1924 in Chriesmasn, Texas to the late Robert L and Sally Lee Varner. Margie was the youngest of seven children. She grew up and attended public school in Cameron, Texas. On May 29, 1940, Margie married Walter William Klapka. To this union, they were blessed with two children, a son, Danny who died at two days old and daughter, Pamela Klapka. Margie worked for Foleys in the Houston area. She was in sales and worked in the cosmetic department. 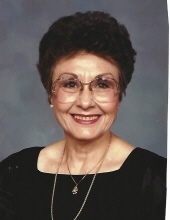 She enjoyed working in her flower garden, watching the “Rockets and Astros games”, cooking fried shrimp and listen to her favorite songs, “How Great Thou Art and Amazing Grace” by Elvis Presley. She was a member of the First Baptist Church of Sealy, Texas, where she served under the leadership of Pastor Robby Magee. Margie is preceded in death by her parents, Robert and Sally Varner, husband, Walter Klapka, one son, Danny Lee Klapka, two brothers and four sisters. She leaves to cherish her memories, one daughter, Pam Merimon (Rod), Cypress, Texas a devoted granddaughter, Mischelle McCarthy (Tim), Sealy, Texas, grandson, James Brandon Sharp (Amanda), Spring, Texas and great-grand son, Skyler William McCarthy of Sealy, Texas. To send flowers or a remembrance gift to the family of Margie Beatrice Klapka, please visit our Tribute Store. "Email Address" would like to share the life celebration of Margie Beatrice Klapka. Click on the "link" to go to share a favorite memory or leave a condolence message for the family.